Acknowledgment: This work was supported in part by the Austrian Research Promotion Agency (FFG) under the Next Generation Video Streaming project "PROMETHEUS". On Feb 18, 2019 both Sandvine and Cisco released their mobile data traffic report and forecast 2018-2022 respectively. Starting with the Sandvine 2019 Mobile Internet Phenomena Report which features mobile data of global (except significant portions of China and India) traffic share for applications with respect to downstream, upstream, and connections. 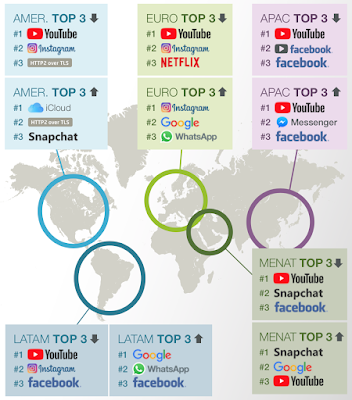 The main message is "YouTube is the global leader with over 35% of worldwide mobile traffic, dwarfing Netflix’s 15% share in the Global Report." 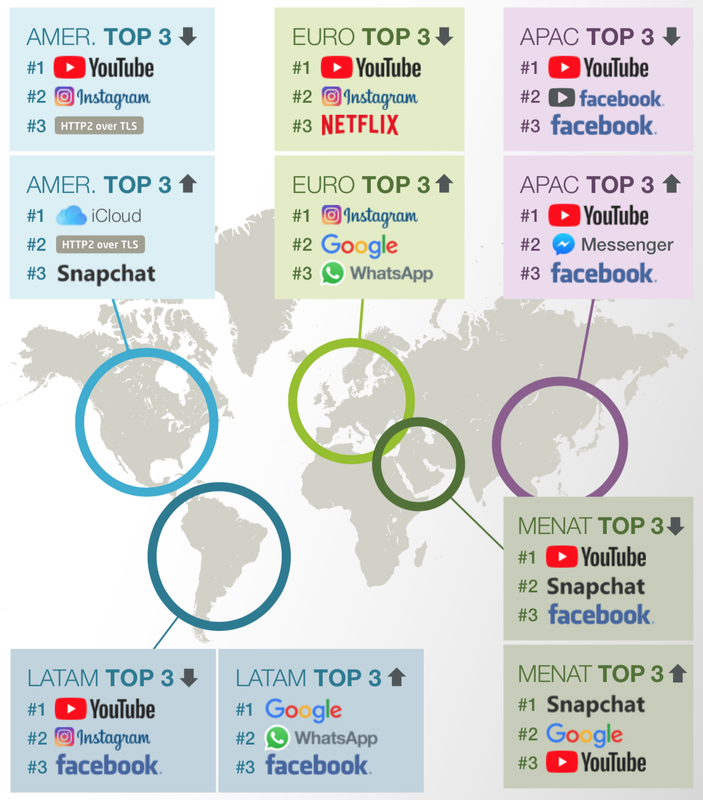 Looking at the global application traffic share for downstream we have YouTube (37.04%), Facebook video (2.53%) and Netflix (2.44%); in total around 42% is video (compared to almost 58% in the global report from October 2018). The top applications are shown in the figure below. Source: Sandvine 2019 Mobile Internet Phenomena Report, Feb 18, 2019. 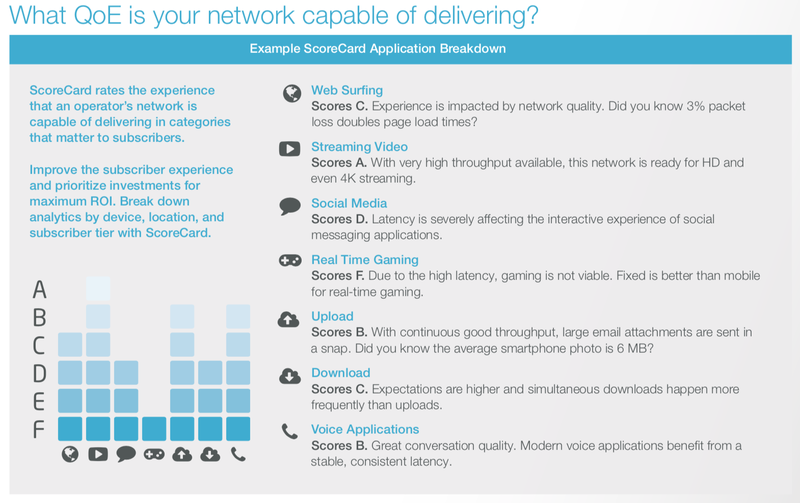 This report also highlights QoE and packet loss which basically focuses on throughput, latency, and packet loss that then leads to a so-called ScoreCard as shown below. However, streaming video here is not considered as a delay-sensitive application which might be true for video on demand but could look different for live service, specifically with respect to the start-up delay and delay compared to traditional TV services. Cisco's Visual Networking Index: Global Mobile Data Traffic Forecast Update, 2017–2022 measured that mobile video traffic accounted for 59% of total mobile data traffic in 2017, which means more than half of all mobile data traffic, similarly to almost 58% in the Sandvine global report from October 2018. However, please note the 42% in the Sandvine mobile report although Sandvine didn't have a specific number for video only. Interestingly, Cisco predicts that nearly 79% of the world’s mobile data traffic will be video by 2022, it will increase 9-fold between 2017 and 2022. Furthermore, mobile video will grow at a CAGR of 55% between 2017 and 2022 which is higher than the overall average mobile traffic CAGR of 46%. 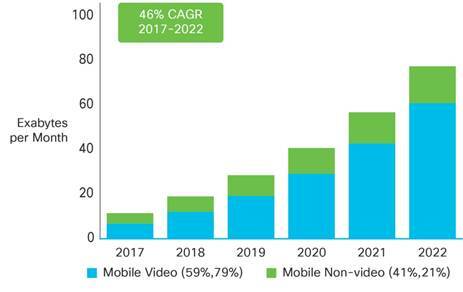 Of the 77 exabytes per month crossing the mobile network by 2022, nearly 61 exabytes will be due to video (see figure below). Source: Cisco VNI Mobile, Feb 18, 2019. What happened in multimedia communication in 2018? In January 2018 I wrote a blog post entitled "What to care about in multimedia communication in 2018?" and I think it's worth looking back to see what actually happened with respect to next generation video coding formats and adaptive streaming techniques. In April 2018, the responses to the call for proposals for the next standard in video compression have been evaluated and a first working draft and test model for the Versatile Video Coding (VVC) standard have been approved. At this point already, some proposals demonstrated compression efficiency gains of typically 40% or more when compared to using HEVC. Currently, working draft 3 and test model 3 of VVC (VTM 3) are available and we may certainly expect compression efficiency gains well-beyond the targeted 50% for the final standard. 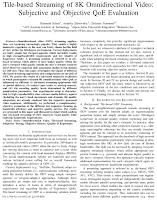 An overview about VVC can be found here (by C. Feldmann) and here (by M. Wien). The licensing issues have been acknowledged and, thus, the Media Coding Industry Forum (MC-IF) has been established. At the beginning of 2018, everyone was also very curious about AOMedia and AV1. Version 1 of the specification has been finally become available and in the meantime it is implemented/deployed on both content provisioning/encoding (e.g. Bitmovin) and content consumption/decoding (e.g., Chrome, Firefox). In this context, we also published a multi-codec DASH dataset comprising AVC, HEVC, VP9, and AV1 (VVC will be added at a later stage). In general, however, we are entering the era of multiple video codecs deployed in products and services whereby this trend is also confirmed by Bitmovin's latest video developer survey. MPEG-DASH 3rd edition has been approved and is awaiting publication but I expect this to happen in 2019 though. 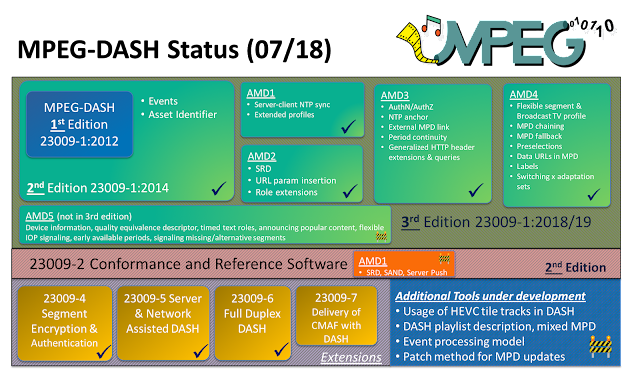 An overview of the MPEG-DASH status is shown in the figure below. In this context, the DASH-IF produced various vital assets such as interoperability guidelines (latest v4.3, content protection, ATSC 3.0, SAND), test vectors, conformance tools, and a reference client. For informative aspects of MPEG-DASH such as the bitrate adaptation schemes the interested reader is referred to our survey. This survey gives an overview about existing techniques (see figure below) and also outlines future research. It is available for free for everyone (open access).